2018 Topps Update Baseball 16 Box Factory Sealed Blaster CASE -16 Robinson PATCH. 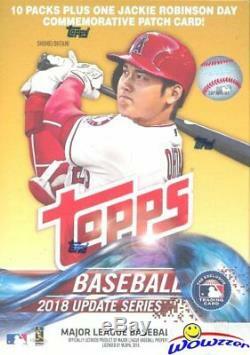 We are Very Proud to offer this Super Hot 2018 Topps Update Baseball EXCLUSIVE Factory Sealed CASE! This Factory Sealed CASE includes SIXTEEN(16) EXCLUSIVE Factory Sealed Blaster Box! Each of these EXCLUSIVE Factory Sealed Box includes 10 Packs & 10 Cards Per Pack for a Total of 100 Cards! PLUS EACH EXCLUSIVE Factory Sealed Box includes a VERY SPECIAL MLB Jackie Robinson PATCH RELIC Card that can ONLY be found in this Box! You get SIXTEEN(16) Of these EXCLUSIVE MLB Jackie Robinson PATCH RELIC Cards in this 16 Box Factory Sealed CASE!! There are 50 different Patch Cards & Rare Autograph & Parallel Versions! Look for MLB Jackie Robinson PATCH RELIC Cards of Mike Trout, Aaron Judge, Bryce Harper, Kris Bryant, Gleyber Torres, Carlos Correa & Many More MLB Superstars! Look for EXCLUSIVE Postseason Preeminence Inserts & Parallel Cards that can ONLY BE Found in these Boxes! This Incredible Set includes Babe Ruth, Derek Jeter, Sandy Koufax, Jackie Robinson & Many other Baseball Legends! Topps Baseball Update Series encapsulates all the best action from the 2018 season and is a must have for every baseball fan! Look for Rookies, Variation, Autographs and Relics of all the Incredible MLB Rookie Crop including Shohei Ohtani, Juan Soto, Ronald Acuna, Gleyber Torres, Miguel Andujar, Rafael Devers, Victor Robles, Rhys Hoskins, Amed Rosario, Ozzie Albies, Clint Frazier Dustin Fowler & Many More! Look for MLB All-Star Stitches Autograph, Jumbo Patch Cards and Much More! In addition, Look for Autographs of MLB Stars and Legends including Mike Trout, Sandy Koufax, Derek Jeter, Aaron Judge, Ichiro, Bo Jackson, Bob Gibson, Cal Ripken & Many More! This Product is Absolutely Loaded! Good Luck with your Pulls! We stock a Huge Selection of Factory Sealed Boxes from every Sport! Plus the Largest Collection of Graded Cards in the World! Be Sure to Check out our 1,000? S of other Items for Sale. Wait to pay until all items have been won OR 3 days after oldest item was won. (Please Note - we are not open on the Weekends and Holidays). Unless an item is damaged, it generally needs to be in the condition it was received, either undamaged or factory sealed, to be eligible for a return. Note on Factory Sealed Boxes and Cases and Graded Cards. S samples and are not guaranteed to be in any particular box or case. On Listing for Beckett BGS Graded Cards. We answer all emails within about 24 hours Monday through Friday. We are an Internet only company; we do not have a retail location. Get business information that counts! - Vendio Counters are active content free. The item "2018 Topps Update Baseball 16 Box Factory Sealed Blaster CASE -16 Robinson PATCH" is in sale since Tuesday, January 15, 2019. This item is in the category "Sports Mem, Cards & Fan Shop\Sports Trading Cards\Baseball Cards".